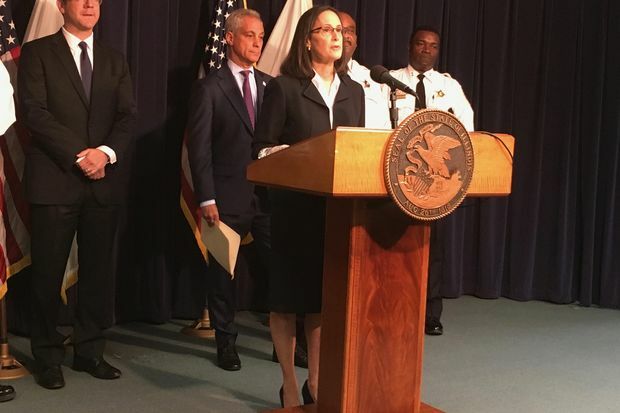 Attorney General Lisa Madigan sued the city Tuesday to ensure a judge would oversee Chicago Police Department reforms. DOWNTOWN — After insisting for three months that there was no need for a federal judge to oversee reforms at the Chicago Police Department sparked by the fatal shooting of Laquan McDonald, Mayor Rahm Emanuel reversed course Tuesday morning. While denying that he had experienced a change of heart, Emanuel said he would "partner" with Illinois Attorney General Lisa Madigan who filed suit against the city Tuesday demanding that a federal judge oversee the reform effort. The reforms were prompted by a U.S Justice Department finding that Chicago police officers routinely violated the civil rights of residents by using excessive force. It also found that officers were poorly trained and lacked supervision. Mayor Rahm Emanuel repeatedly promised not to allow the effort to craft a consent decree turn into an attack on Chicago police officers, whom he praised as "honest and hardworking men and women." "Unfortunately, Chicago has a long history fraught with tragedies followed by failed attempts at reform," Madigan said as Emanuel and Chicago Police Supt. Eddie Johnson looked on. "The result is broken trust between the communities and the police. This makes it much more difficult to prevent and solve crimes." "Real, lasting" reform will require a a legally binding agreement — known as a consent decree — enforced by a federal judge, Madigan said. "Black and brown residents of the city live in fear of criminals and the police," she said. "This has to change." In June, Emanuel defended his decision to ask the Trump administration's Justice Department— led by Attorney General Jeff Sessions — to appoint an independent monitor to keep tabs on the reform effort without the oversight of a federal judge. “This is the model that is exactly the right way," Emanuel said in June. However, Madigan said any agreement short of a consent decree enforced by a federal judge would "not have been good enough" because it was not enforceable. Justice Department spokesman Ian Prior said it would be a "positive step" if city and state officials "can put in place policies and practices to ensure constitutional, proactive policing that actually serves to reduce Chicago's rampant violent crime problems. "However, we have said repeatedly that we will not agree to or support any measure that will endanger the lives of Chicago's residents or law enforcement by eroding the rule of law or by failing to properly address violent crime in Chicago," Prior said. "We will continue to work with the city to meet those goals." Madigan said that it was unprecedented for a state attorney general to ask a federal judge to impose a consent decree without the involvement of federal officials. "We are stepping into the shoes of the Department of Justice, which abandoned this effort," Madigan said. "It is clear that the Trump administration's view of policing is not consistent with our own. My office will take the lead." Emanuel said he and Johnson would continue their work to craft the "most professional, proactive department." However, Madigan's lawsuit argued those reforms "are insufficient to eliminate the city’s decadeslong policy, custom, or practice of unlawful conduct and to ensure it will not recur." Emanuel repeatedly promised not to allow the effort to craft a consent decree turn into an attack on Chicago police officers, whom he praised as "honest and hardworking men and women." That did nothing to assuage the concerns of Fraternal Order of Police President Kevin Graham, who Tuesday afternoon called the decision to begin negotiating a consent decree "a potential catastrophe for Chicago." The surge of violence that swept the city in 2016 has shown no sign of abating, although murders and shootings are down slightly this year compared with last year. The "scrutiny has been difficult for some officers to process," Johnson said. But most officers have embraced the "new way of doing things," Johnson added. "I don't think this is a blow to their morale," he said. The lawsuit filed by Madigan marked the second time she has brought the power of her state office to advance Chicago police reform efforts against the expressed wishes of Emanuel, a fellow Democrat. Madigan requested the Justice Department investigation of the Police Department in December 2015 after the video of a Chicago police officer firing 16 shots into McDonald touched off intense protests. Faced with a rising tide of criticism — including from then-Democratic presidential nominee Hillary Clinton — Emanuel had no choice but to drop his opposition to the probe. On the day that the report's findings were announced in January 2017, Emanuel signed an agreement promising to negotiate a consent decree to ensure that reforms were implemented under the authority of a federal judge. He later blamed Trump officials for blocking such an agreement. Sessions said in February that he had not read the 161-page report and dismissed some of its findings as "pretty anecdotal, and not so scientifically based." Sessions has long been a critic of consent decrees. In 2008, the then-U.S. senator called consent decrees "dangerous" and said they "constitute an end run around the democratic process." Chicago Police Board President Lori Lightfoot Tuesday praised Madigan's decision to take the lead on the reform effort. Before being appointed to another term on the board, Lightfoot was deeply critical of Emanuel's decision to step back from his promise to negotiate a consent decree. Lightfoot said she was pleased to hear Madigan promise to allow Chicagoans to weigh in on the agreement before it is finalized. "Let the people see how the sausage gets made," Lightfoot said, adding that will give it greater legitimacy in the public's eye. Lightfoot said it was "mistaken and misguided" to see the push for a consent decree as part of an attack on police. "We can't ignore the facts uncovered by the Department of Justice," said Lightfoot, who also chaired Emanuel's police reform task force. "We have to give officers the tools to engage in constitutional policing." A consent decree will give "more structure and more rigor" to the reform effort, Lightfoot said. Madigan gave no specifics on what the consent decree should contain, how long it would be in place once crafted and how much it would cost taxpayers. "It is not clear what the price tag will be," Lightfoot said. "But it is not going to be cheap." The city paid out nearly $50 million last year to settle police misconduct lawsuits — a cost that should be significantly reduced under a reformed department, Lightfoot said. Most police department consent decrees last about a decade, Lightfoot said. "It is better to do it right than fast," Lightfoot said. "There should be no artificial timeline. We know there are structural, fundamental changes that need to be made. The sooner, the better." In Oakland, Calif., the scandal-plagued police department has been under a consent decree since 2003. The consent decree covering the Chicago Police Department — which will be overseen dailly by an independent monitor who would report to a federal judge — will include strict deadlines and a robust enforcement mechanism, Madigan said. In June, Black Lives Matter Chicago and other anti-police-violence groups filed a lawsuit demanding federal court oversight and damage awards to people who were subject to "excessive force" and "false arrest" by officers. City attorneys asked a judge to dismiss that lawsuit this week, saying that the city already is committed to reform. Emanuel did not answer a question Tuesday about why he decided to partner with Madigan and not the community groups. Emanuel, who is expected to decide this summer whether he plans to run for a third term as mayor, has already proposed and implemented a number of changes in the Police Department, including additional mental health awareness and de-escalation training as well as a revised policy that will determine when and how police officers can use force. In addition, a new $1.8 million unit in Inspector General Joseph Ferguson's office will be charged with scrutinizing police misconduct investigations and the discipline imposed on officers. 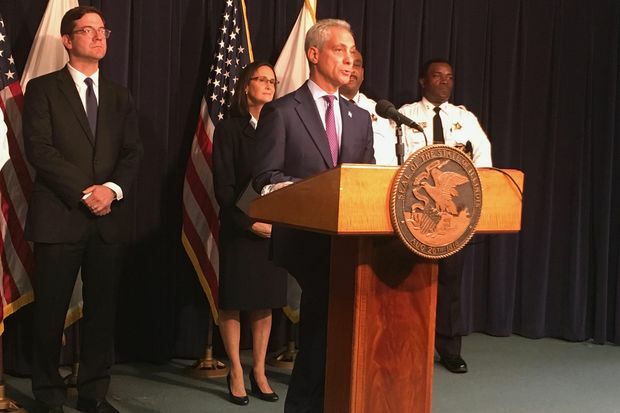 A new agency — the Civilian Office of Police Accountability — will begin investigating allegations of excessive force and misconduct by police officers in September, and Emanuel has promised the new agency will work more thoroughly and faster.